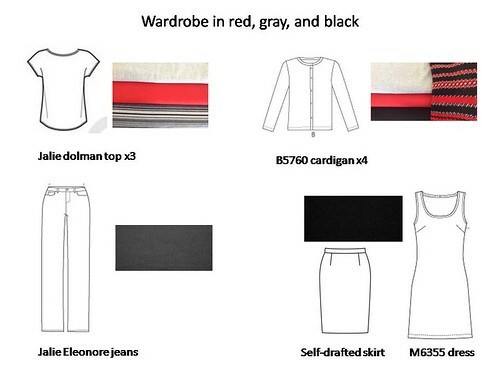 Here’s my new plan for wardrobe building. 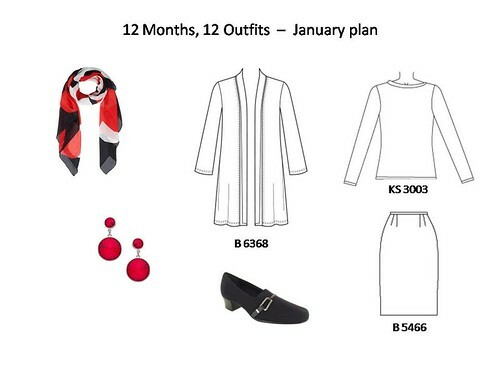 I’m taking inspiration from Janice’s 12 Months – 12 Outfits series at The Vivienne Files where she chooses six scarves at the beginning of the year and builds coordinating wardrobes around them one outfit per month. This year, two of the scarves feature a color palette that’s basically dark neutral, light neutral, and two shades of one accent color. 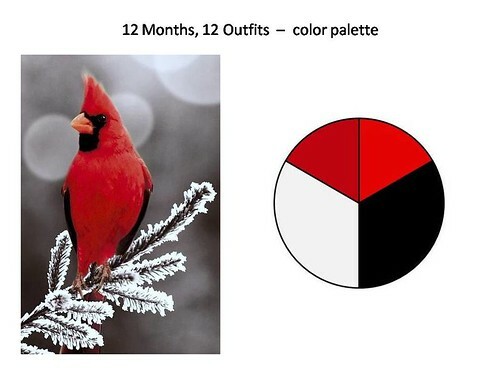 I’ll be working with black, pale gray, and shades of red. 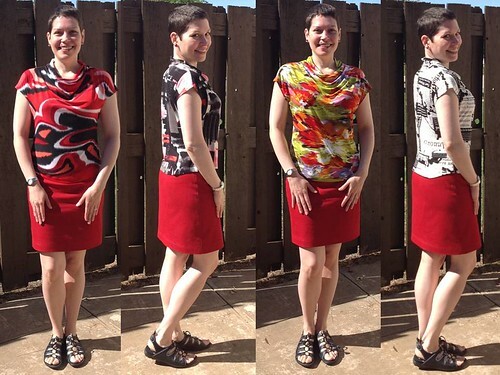 Janice’s posts will serve as a blueprint or inspiration for my sewing projects each month. I figure there may be times where an existing garment will work really well but for the most part I expect to sew each outfit. I tend to wear skirts and dresses much more than pants so I’ll adjust the ratio accordingly as we go. 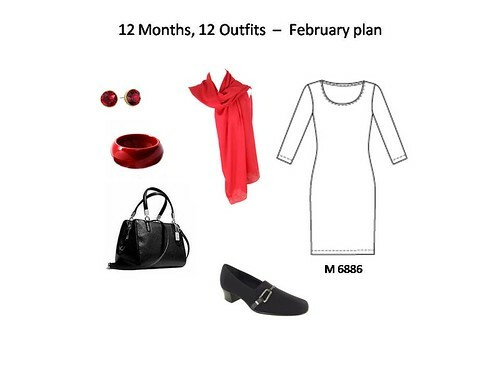 The plan for January looks pretty easy – black skirt, red cardigan, and pale gray (or maybe red) long-sleeved top. I already have the skirt and top patterns fitted, and the cardigan shouldn’t require much adjusting. 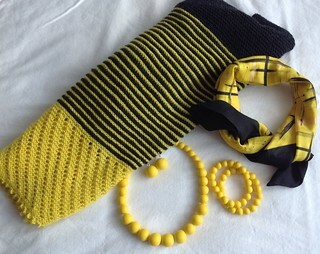 As far as the accessories, the shoes shown are my favorite work shoes, the earrings are in the jewelry drawer, and the scarf is representative of several I already own. I’ve noticed that having sunshine makes all the difference when I’m cutting and sewing black fabric so I’ll probably start with the skirt if it’s sunny next week. Or if it’s all cloudy and gray, I’ll start with the top. The week started off cool, with temps in the 60’s. 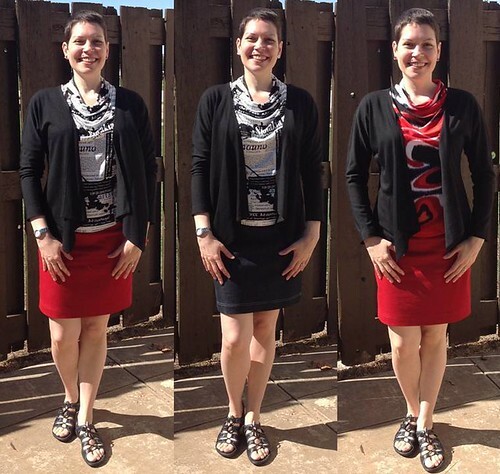 On Sunday I wore the black denim skirt from my recent SWAP, a red long-sleeved top (M6355) in Sophia double knit, an altered RTW scarf , and a me-made bracelet and earrings set. Still cool on Monday so I swapped the colors. Red denim skirt from the SWAP, gray mystery knit top with long sleeves (M6355), same altered RTW scarf as the day before (this scarf has been getting a lot of wear in the last six months or so), and the same bracelet and earring set again. On Tuesday it was warmer, but still cool enough that a cardigan was welcome. 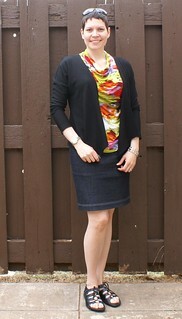 I wore the black denim skirt with the multicolor rayon jersey top (Burda 6695) and black wool jersey cardigan. All three pieces from the SWAP. On Wednesday it was plenty warm and I wore the off-black denim skirt from the SWAP with an old RTW asymmetrical top. It was this top that inspired me to look for a pattern with cut-on cap sleeves when I was sewing the spring 6-PAC. On Thursday, back to red. Red denim skirt and red/black ITY poly jersey top (Burda 6695) from the SWAP. On Friday I was testing a new me-made bracelet and it doesn’t go with the reds. 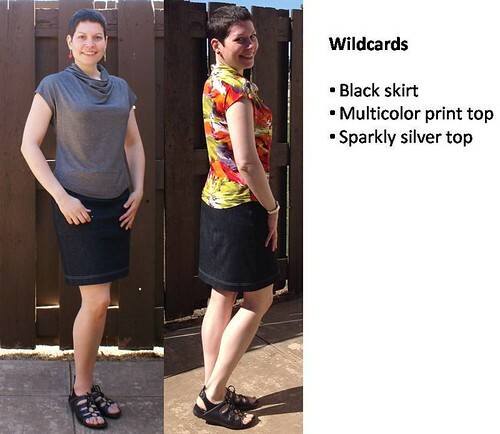 So I wore the black denim skirt and the silver metallic rayon jersey top (Burda 6695) from the SWAP. The bracelet turned out to be a step in the right direction in terms of sizing so there will be more bracelets soon. For Saturday’s running around, the red denim skirt paired nicely with the dark gray rayon jersey top (Burda 6695) and a me-made bracelet with earrings. Most of these clothes were from my recent SWAP, mostly because that’s pretty much all that’s wearable in my closet right now. I’m working on sewing up more pieces. I made a rich red rayon jersey top today and I’ll be wearing it soon. I also have a piece of white denim for a skirt that I plan to make tomorrow so there should be a bit more variety coming up. In other news, I’ve been feeling an overwhelming urge to knit another Viajante. But I had a slight mishap with the business end of a clay blade a couple of days ago so one of my main knitting fingers is currently, er… on light duty, shall we say. I made only a few alterations to the pattern: shortened the back and lowered the back neckline to account for my erect posture and low neck base, and shortened the hem 1″ all the way around. I left the front neckline as it was because 1. I didn’t want to fiddle with the complex-looking piece, and 2. it’s going to drape anyway. Once I made the first top, I knew I had a winner so I just kept cutting and sewing. The fabric that is mostly red is a poly/lycra ITY jersey. I actually made two tops using it, same pattern. It’s comfortable and feels nice, if a little bit swimwear like. 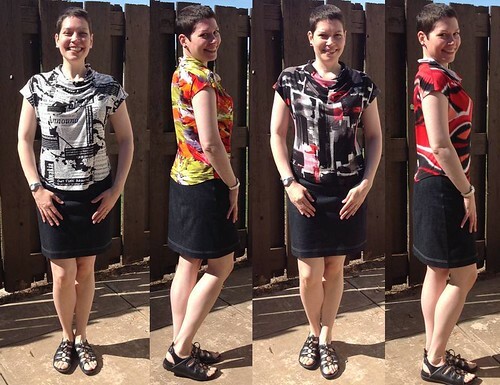 The other three prints are rayon/lycra jersey. I don’t know what rock I’ve been living under that I never knew about this fabulous material. It’s awesome! I’ll be ordering and sewing up more. The skirts are my own frankenpattern of BWOF 3/02 #125. I copied the shape of the part below the waist, then brought it in a bit at the waist using a curved ruler and some guessing. I used the existing darts in the back and left the front plain. The waist is finished with elastic. 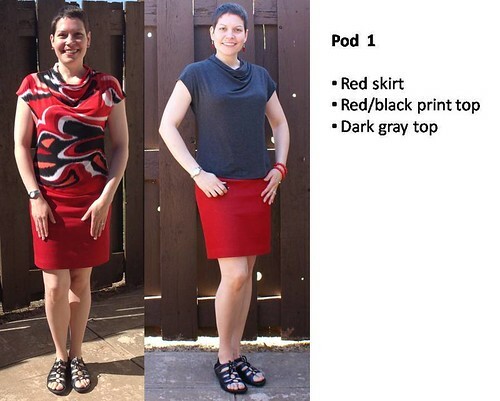 I was going for the same concept as Pamela’s Magic Pencil Skirt, only without her pattern and without any tapering at the hem. The skirt fabrics are both denim. The black denim is a cotton/lycra blend from JoAnn’s. It’s very comfortable but it does seat out a bit after spending an hour or so in the car. I don’t mind it much; it was a test version that turned out very wearable. The red denim is a cotton/poly/lycra blend from EmmaOneSock and it’s awesome! It has excellent recovery so no seating out. I have ordered more. 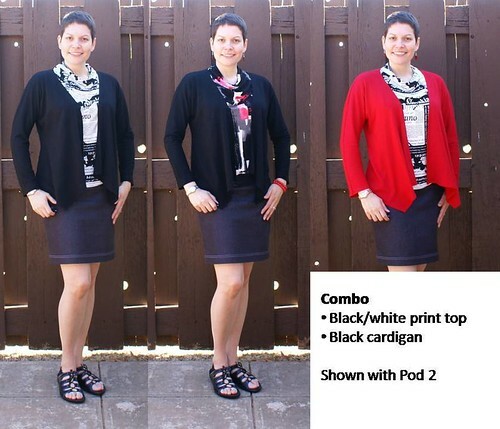 For the cardigan, I wanted to use Simplicity 1945 view A but when I compared it to the top pattern, it was clear that the batwing sleeves were just much too big. 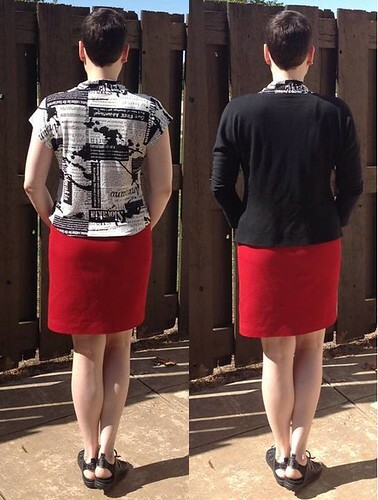 So more frankenpatterning ensued: I took the BWOF 3/02 #125 for the back and most of the front, then merged the waterfall part of Simplicity 1945 into it. I think it worked out quite well. In the next iteration, I will bring the shoulder seams closer to the neck by a half inch or so, to keep the neckline from feeling too wide. The fabric for the cardigan is a lightweight wool jersey from Elfriede’s Fine Fabrics in Boulder, CO. It feels like forever since I visited it. The jersey is perfect for this cardigan – just the right weight and warmth. Well, this is all I can remember right now. 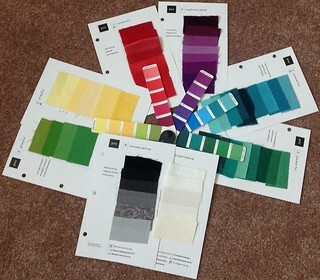 I have a bunch of other fabrics in the queue, just waiting to join this mini wardrobe in the closet. I’m really loving all the prints and the comfy skirts so there will be more of them. I’m thinking about making some solid tops with patterned skirts to see if that works just as well. If not, I’ll go back to printed tops and solid skirts. We’ll see. I’m still here and sewing. Only “here” is no longer in Germany, but in Oklahoma. (For now, anyway. We had barely gotten settled into our new home when we got news about our next assignment, coming up in less than six months now.) When the movers packed up and crated my sewing studio early last December, I missed my machines dearly. And since I unpacked and set up the studio at the end of February, I’ve been giving them a lot of love. Above is a peek at my work in progress – a mini wardrobe that might blossom into a full SWAP because spring is in full swing here and summer just around the corner. 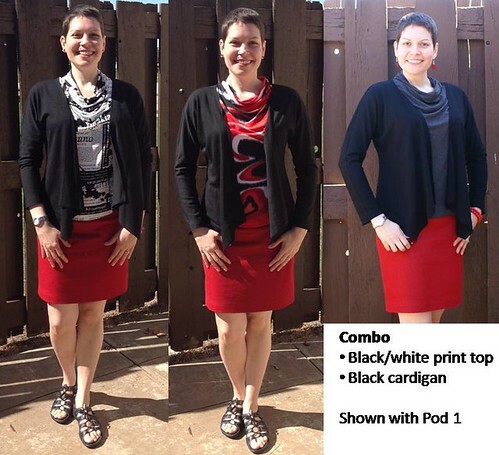 On the right side is a black denim skirt, then three tops in colorful prints, and on the left you can see another print for a top, red denim for a skirt (which has become a reality between when I took the picture this afternoon and now when I’m typing this), and black wool jersey for a cardigan. I’m expecting a few more fabrics before the end of this week that will work well in this wardrobe. I just wanted to check in briefly so you all don’t think I fell off the face of the planet. More soon.